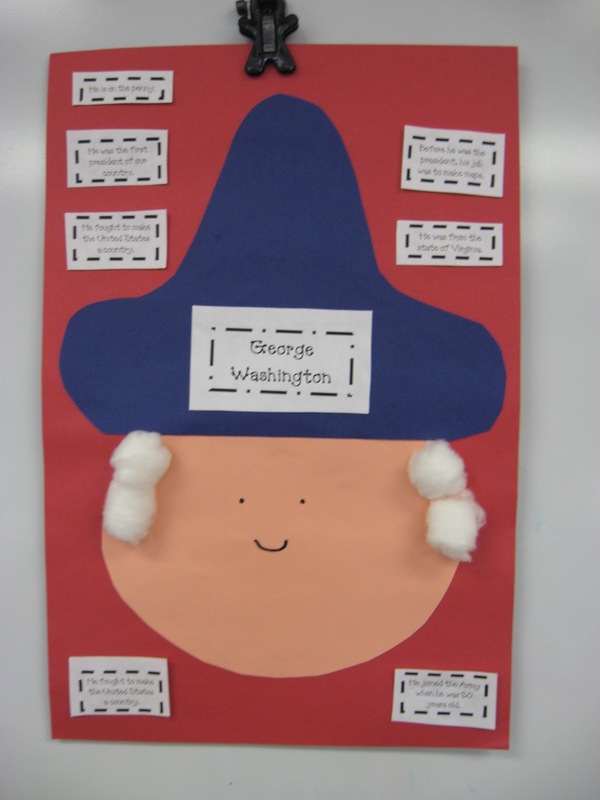 So, here are a couple of things we're doing in First Grade this week to celebrate the old presidents. 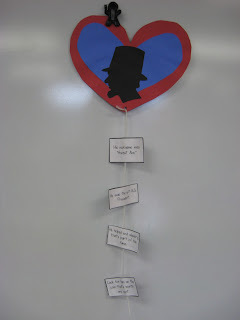 This week I wanted to incorporate President's Day into my reading workshop, so I made this little center. President’s day theme? 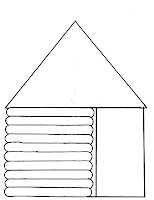 Lincoln’s cabins. The idea is pretty basic. Here are some example sorts. 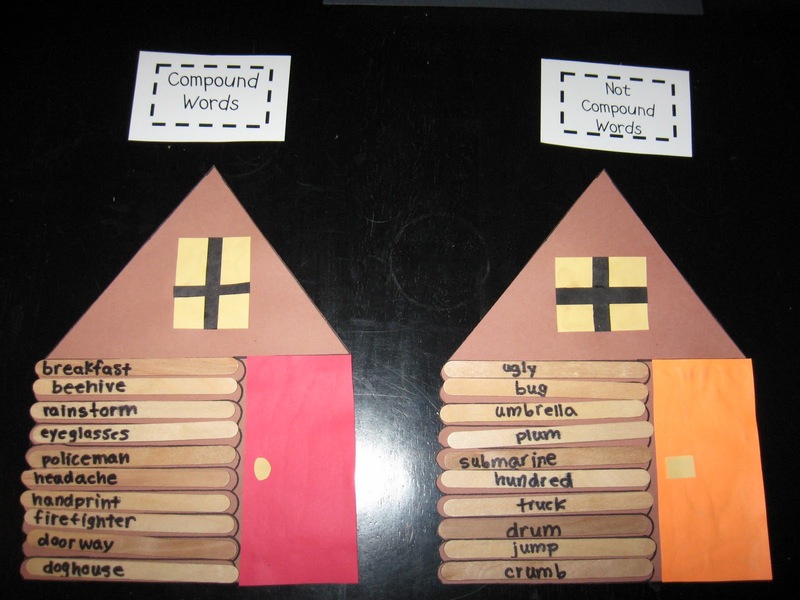 What I love about this center is the variety of sorts you can make to differentiate for different kiddos. 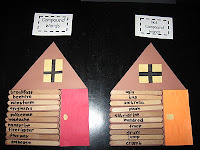 I stuck to sound sorts when I made my cabins, but you can also make syllable sorts, type of speech sorts, computation sorts, even and odd number sorts, and all other kinds of sorts with this pattern. I know it is ugly!!!!! See explanation below. To improve your cabins, I suggest adding some Cabin Bling. I just added a door and a window to mine because I am an underachiever, but that shouldn’t prevent you from going wild!!! You may also want to laminate your houses for durability. 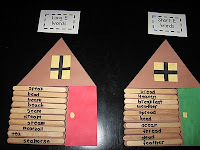 After you’ve made your houses, program craft sticks for whatever skill you want your kiddos to practice. Math, reading, whatever. 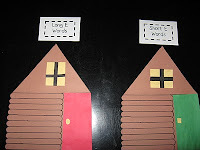 You also want to create labels for the houses (e.g. “Long E Words”, “Short E Words”). To store this center, I put all of the sticks for each sort into a different labeled baggie. Then, I pull specific sorts for different kiddos who need work on different things. Or, when I’m feeling crazy, I just put out all of the baggies and the kids can sort whatever two groups they feel like. Before sorting the kids like to "shuffle" the sticks- translation: dump all of the sticks on the floor and swirl them around like there's no tomorrow. Then they get down to sorting business and once they’re done, the sorting sticks and labels go right back into the baggies. EASY! So I totally wish that I could take credit for this super cute idea, but I can’t. It was entirely the mind-child of my brilliant and adorable colleague, Mrs. Shackelford. My class hasn’t actually done this activity yet, but here’s how I plan on doing it. First, the kiddos are going to make their mobiles (glue a presidential silhouette to each side of a heart- EASY!!!!). Then, the kiddos will sort statements about each president onto to either side of their mobile, gluing them to the mobile tail. Simple and cute. And who can’t use a little simplicity in their life?! Here's what it looks like when it's done (one pic of each side). I love the log cabin sort. I have the Old World Cartridge for the Cricut and I believe it has a cutout for a log cabin! This is such an awesome idea and like you said it is so versatile! 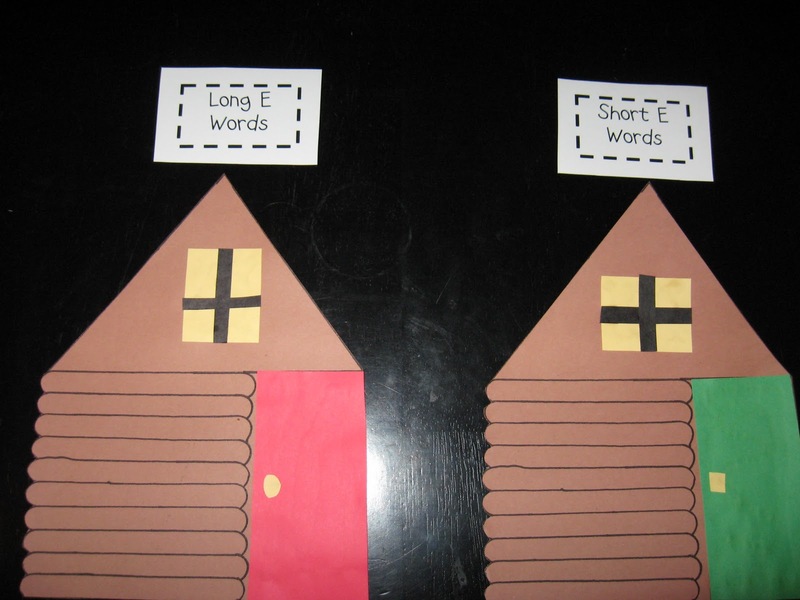 Just love your cute idea of the log cabins! How clever! I will need to make time to complete this project with my group this week. Thanks so much for sharing! Could you direct me to the "ugly" pattern? Thanks so much! Great idea. We are working on the long e sound this week and should be ready for it next week. I also could not locate the log cabin pattern. Thanks for the ideas!!!! They are the best. Thank you so much for your e-mail on the patterns!!! You are awesome!! Okay, I reposted the link in a much more obvious fashion. Just click the pic to download the pattern. I was too embarassed to post a picture of it initially because it's so ugly! Ha! Super cute -- thanks for the ideas! These are great ideas! I can't wait to use them next week. Thanks for sharing! LOVE these activities! THANK YOU sooo much for sharing! would you mind sharing patterns with me as well? Thank you tons! The log cabins are such a neat idea! I'm going to use it to sort facts and opinions about the Presidents! Thanks so much for sharing. WOW! I stumbled upon your blog when looking for some ideas for President's Day. I am SO impressed! Teach me how to blog...HA! Thanks for sharing. WOW!!! 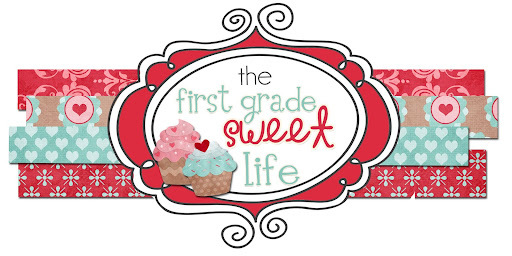 I'm on spring break and loving your blog! Fantastic Stuff! I know President's Day is 11 months away, but it is so darn cute, I'd like to have for next year. If it isn't too much trouble, could you email me any patterns from Posts 1 and 2 for presidents? Thanks so much for sharing your FABULOUS ideas!! Could you send me the template for the President's day mobile? I want to use it for President's day this year! "Submarine" is a compound word. Can't wait to try it! 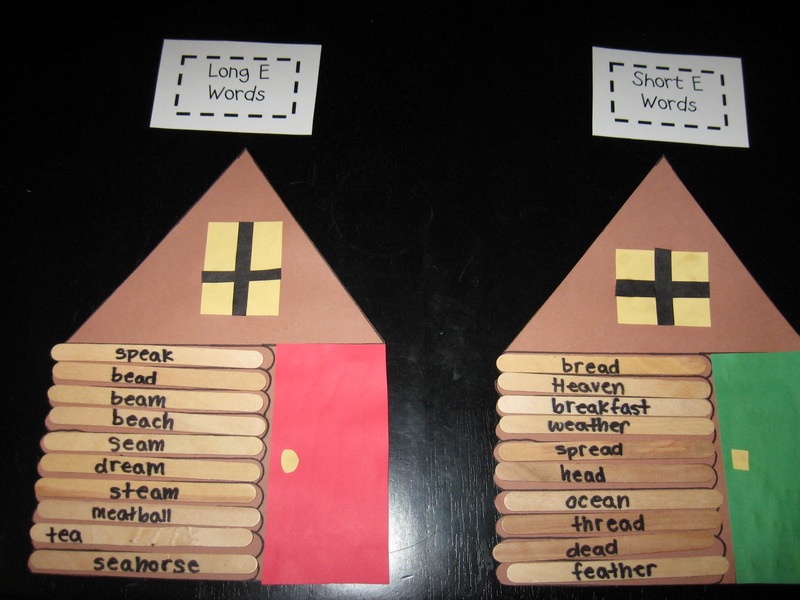 We are working on compound words next week..and I'm going to find a way to incorporate that. Love your ideas! OMG just found site and it's wonderful!!!!!!! Love your ideas and your other links to other peers sharing ideas, centers, and activities!!!!!! 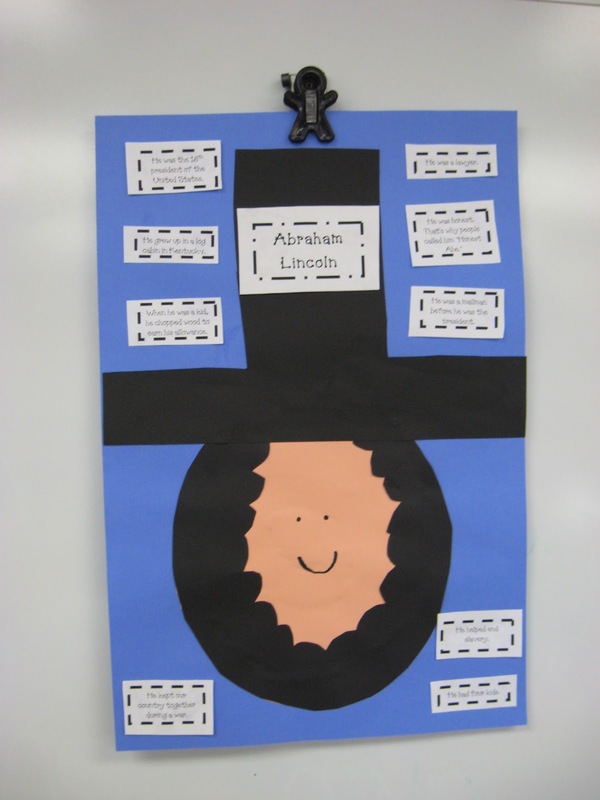 If you wouldn't mind also sharing President cutouts for mobiles would love to complete with my first graders will be doing log cabin sort. Great Idea!!!! I LOVE your blog! SOo many great ideas that have helped me in my first two years teaching! I would LOVE the patterns for the President's if you don't mind! Thank you sooo much!! I LOVE these ideas! Thanks so much for the patterns! I'm featuring them in my Sharing Saturday post tonight! I love your log cabin idea. Thanks for sharing all your great ideas. Thank you so much for the great ideas! 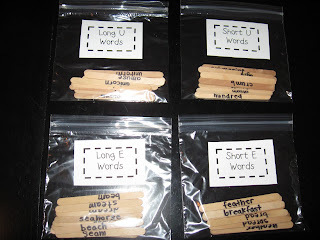 I hope to use these ideas this week! 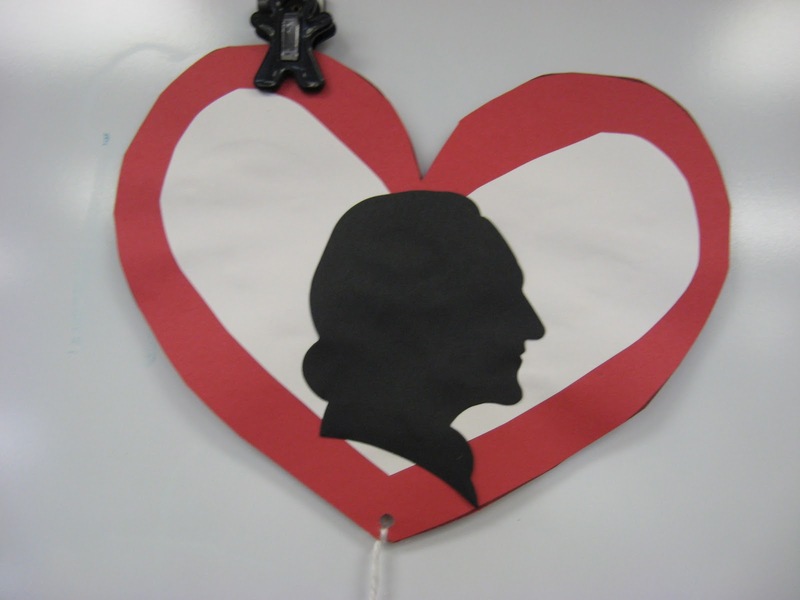 Could you please send me the patterns for the president's day activities? Thank you again! I came across your blog while looking for President's Day crafts. 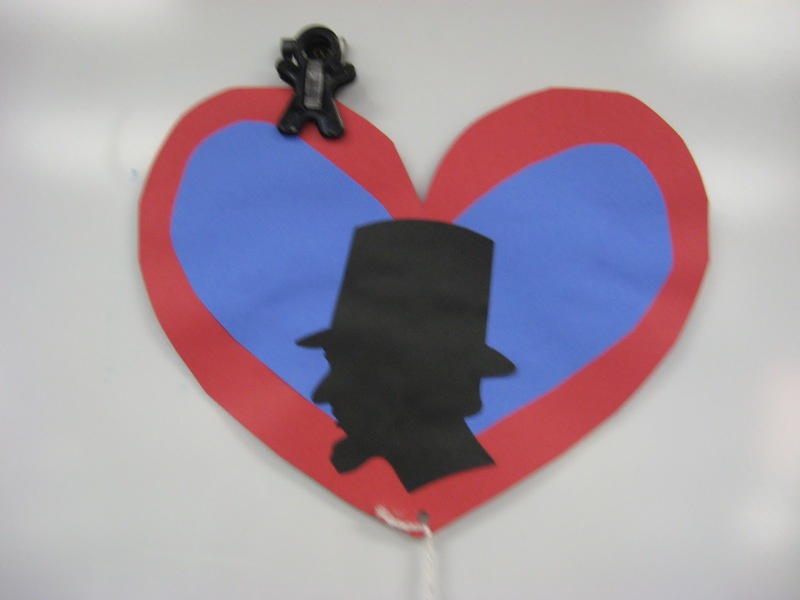 Would you mind sharing your Washington and Lincoln patterns with the crafts, please? I would greatly appreciate you emailing me the patterns. Hi! I love your spirit and enthusiasm for teaching! I would love to have the patterns for the president's day mobiles to do with our fourth grade buddy class. Would you mind sharing? Thank you! For the mobile I found some google images and printed then out. Just search Washington or Lincoln silhouette. I just printed out the log cabin template and pinned it! Great ideas. I would love to have the Lincoln and Washington sort patterns. Would you consider posting them or sending them to me? They look ideal for my students. 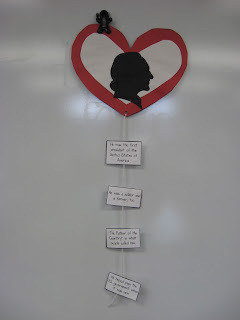 I would like the templates on the facts and faces and the silhouette mobiles. Can you send them to me? Would you mind sending me the Lincoln and Washington faces with facts and the President Mobile! Very cute. Thank you very much!